A Valora team developed the new concept for the avec stores in just five months. This concept incorporates the latest food-on-the-go and convenience trends, and is expressed by a modern design, handmade and ultra-fresh products and a regional produce label. Roger Vogt, CEO Retail Switzerland at Valora explains the concept from his viewpoint. I like to cut right to the chase. Things must go fast and have a targeted outcome, and we must also show courage. This is the only way for a company to keep surprising its customers in an extremely fast-paced market. And I am convinced that we managed to do this with the new avec concept. This concept was created with enormous courage, unbelievable passion and a great team performance. The outcome is a unique convenience concept with a clear shop design, a new regional produce label, and a large range of handmade and ultra-fresh products. avec – the first of its kind. Snacking, out-of-home consumption, mobility. These are irreversible trends in our society. Ever more micro households, no big shopping trips on a weekend, ever more commuters. These people all meet at transport hubs and want to quickly buy or eat something on the go. Who else should meet these needs but Valora with its around 1,200 small-scale points of sale at such highly frequented locations? In the last five months, I and my team thought about what we could do differently. More modern, fresher, healthier. Joining forces with our Innovation Lab, we studied the trends and finally also found solutions. One of the most important needs that we wish to meet is the permanent availability of ultra-fresh products. This is why we now offer an array of fresh products that changes several times a day under the ‘Handmade with Love’ label, including some 50 sandwich creations, salads, hot dishes and fruit cups. This not only means that our employees must have enough time to prepare these products, but also requires us to reorganise our logistics processes. We are currently developing regional production hubs that will allow us to service our stores with handmade and fresh products faster, several times per day and without harming the environment. I believe that the range of regional products we are currently developing is an absolute novelty in the Swiss convenience business. Nobody currently offers this in the convenience sector. Fast availability does not have to mean that the products cannot be regional. Fully in keeping with the principle: From here. Regional for you. Another new speciality is the new creations by food bloggers. The first product in this range is the ‘Hummus LiebelEi’ sandwich created by Nicole Giger (www.magsfrisch.com). And last but not least, customers can look forward to an adjusted and attractive price structure. I am proud of our new avec store and excited about the reactions of our customers. Early on, we had put ideas to paper. But then we also wanted to see the reality, and did a lot of finetuning. Sometimes we were excited about an idea, and then we tested it and had to reject it. And we started again and kept on going until we were all satisfied. Every product had to find its place on the shelves. Different products are needed in the morning than at lunch or in the evening. It must smell fresh and always look attractive. Our new bread table in the centre of the store perfectly expresses this concept: aromatic and fresh bread and baked goods at any time of the day. People just have to like coming into our store. This is our overarching goal. This is my ambition as CEO of the Swiss retail business of Valora. And I realise that this is not a concept for eternity. The process will not end with the opening of our first new avec store at Bern main station. We will continue to develop the format further. We want to react to the feedback received from customers, while still always surprising our customers with new ideas, and that is what we will do. That’s a promise. avec is Valora’s convenience concept in Switzerland and Germany. Some 140 small-scale points of sale expand the selection at highly-frequented locations, such as train stations and petrol stations. In addition to a varied range of products prepared freshly every day, including sandwiches and baked goods, fruit cups, salads and coffee creations, the stores also offer other foodstuffs, household and kiosk goods, lottery tickets and various other services. The avec stores’ wide range of fresh products for immediate consumption is on offer from early until late, 365 days a year. Roger Vogt has been in charge of the Valora retail business in Switzerland since 2018. 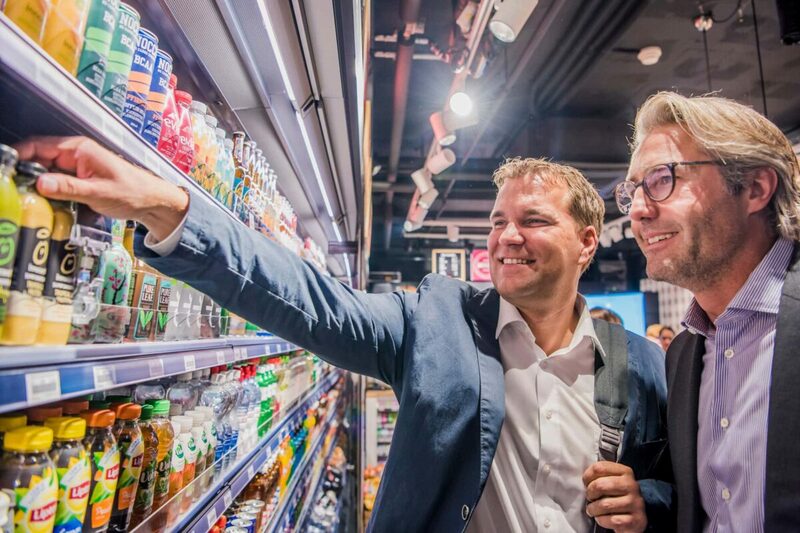 In this function, the 40-year-old is responsible for further developing and expanding the Valora retail business with the formats k kiosk, Press & Books and avec in Switzerland. Previous PostPrevious Caffè Spettacolo: Do some good by drinking coffee!